McAfee Host Intrusion Prevention for Server proactively secures against known and new zero-day attacks. It boosts security and lowers costs by reducing the frequency and urgency of patching. Host Intrusion Prevention integrates with the McAfee ePolicy Orchestrator (ePO) platform for centralized reporting and management that’s accurate, scalable, easy to use, and works with other McAfee and non-McAfee security products. Comprehensive security — Host Intrusion Prevention for Server uses multiple proven methods, including behavioral and signature analysis, plus a dynamic stateful firewall buttressed with global reputation technology to block emerging attacks. Advanced vulnerability-shielding capabilities — Better protection against exploits that target new vulnerabilities means your IT staff has more time for planning, testing, and deploying patches. Customized server protection – Host Intrusion Prevention for Server helps maintain server uptime with specialized protection for web and database servers. Enhanced security powered by McAfee Global Threat Intelligence — McAfee Global Threat Intelligence (GTI) is a comprehensive cloud-based threat intelligence service. Already integrated into McAfee security products, it works in real time, 24 hours a day, to protect customers against cyberthreats across all vectors — file, web, message, and network. McAfee GTI offers the broadest threat data, most robust data correlation, and most complete product integration in the industry. McAfee’s GTI network allows enabled products to evaluate threats on multiple vectors in real time, leading to faster identification of threats and higher capture rates. Host Intrusion Prevention for Server uses the McAfee GTI file reputation service and network connection reputation service to find suspicious files before they are identified as carrying malicious payloads, as well as domains/IP addresses that are infected or hosting malware attacks, and block those attacks. Corporate servers house an organization’s most valuable information assets and keep the business running. One of the top IT challenges is to successfully protect these servers and the applications they host from known and unknown attacks that threaten to disrupt business. McAfee® Host Intrusion Prevention for Server delivers specialized web and database server protection to maintain system uptime and business continuity along with the industry’s only dynamic and stateful firewall to shield against advanced threats and malicious traffic. In addition, it also provides signature and behavioral intrusion prevention system (IPS) protection. McAfee Host Intrusion Prevention for Server reduces patching frequency and urgency, preserves business continuity and employee productivity, protects data confidentiality, and simplifies regulatory compliance. Servers are increasingly the target of attacks because they house large amounts of corporate data and are also critical for performing day-to-day activities. McAfee Host Intrusion Prevention for Server secures mission-critical servers to maintain system uptime and productivity. A large percentage of exploits are released as early as three days after disclosure of the vulnerabilities. Yet, for many organizations, it may take up to 30 days to test and deploy patches for all endpoints. McAfee Host Intrusion Prevention for Server bridges the security gap while making the patching process easier and more efficient. Servers are vulnerable during startup because the security policies have not yet been enforced. During this vulnerable startup time, they could be subject to network-based attacks and security services could be disabled. McAfee Host Intrusion Prevention for Server blocks attacks from occurring during this vulnerable window with firewall and IPS startup protection. Creating and maintaining multiple firewall and IPS policies is necessary in a large organization but is usually tedious and time consuming. McAfee Host Intrusion Prevention for Server policy and IPS catalogs streamline that process, allowing you to create and maintain multiple firewall and IPS policies that can be applied as needed. Optimize and simplify management further with McAfee ePolicy Orchestrator® (McAfee ePO™) software, our single, centralized console, which helps you oversee and administer all your protection. Full integration with McAfee ePO software saves you money and time with significant operational efficiencies. Virtualization has been adopted by practically all IT departments and compatibility with the major virtualization platforms is essential for any product to be successful. McAfee Host Intrusion Prevention for Server 8.0 is compatible with the three major virtualization platforms, VMware, Citrix, and Microsoft Hyper-V. The following table lists the supported products from each of these three vendors. 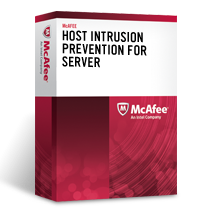 Download the McAfee Host Intrusion Prevention for Server Datasheet (PDF).